Yorktown, VA, occupies a unique place in American history as the site of the last major battle of the Revolutionary War. 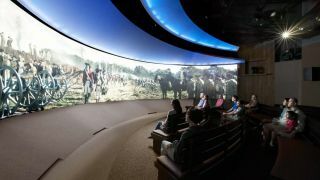 The new American Revolution Museum at Yorktown, administered by the Jamestown-Yorktown Foundation, depicts the drama and hopes of the revolution through period artifacts, immersive environments, and interactive exhibits and theaters, including the experiential Siege Theater. The galleries culminate in the 4D experiential Theater where 40 to 70 visitors at a time are transported to the Siege of Yorktown complete with wind, smoke, lightning, and thunderous cannon fire. The theater’s 180-degree surround screen immerses visitors in the thrill of the of the allied American and French victory over the British Army. The Virginia Beach branch of the Richmond, VA-based company Whitlock served as systems integrator for the museum. The video collaboration company offers strategy, enterprise management, interactive environments, cloud, and global support to a wide range of clients in energy, finance, government, legal, healthcare, high tech, and education. Whitlock chose an Alcorn McBride A/V Binloop HD multichannel video and audio player to run the 9-minute presentation in the Siege Theater. Five channels of the system feed five edge-blended laser projectors dedicated to the 71-foot curved screen. Cortina Productions designed and produced the content. A second Alcorn McBride A/V Binloop HD feeds a number of other rooms in the museum, including the Introductory Theater and its “Liberty Fever” presentation. Although the American Revolution Museum at Yorktown gallery exhibits are already open to visitors, it the museum will hold its grand opening celebration and dedication ceremony this spring, marking the completion of its outdoor interpretive areas.